Today was a test and a test I would have to say personally that the CFA and DSE websites passed with flying colours. There was one hiccup which was changing the layout of the site and removing some of the complication of Java Script which may have made the site slow loading for mobile data people. I personally am pleased at the result. There are several areas that could do with MASSIVE improvement. 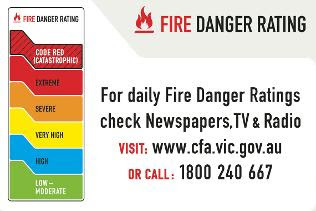 One of those is the Herald Sun – the Total Fire Ban symbol for as long as I can remember was ALWAYS on the front cover. Someone reading the paper opposite – you KNEW it was Total Fire Ban. You walk past the counter at the newsagent - KNEW it was Total Fire Ban. Today the Melbourne Herald Sun had the Total Fire Ban symbol on PAGE 4. The ONLY way I would know it was a Total Fire Ban, if the ONLY paper I read, or the only news I received was from this paper, would have to sit down and open to PAGE 4. - I am absolutely disgusted. Another thing that upsets me greatly – is the new classification codes. Sure they are aimed at personal responsibility and being accountable for your own actions. I 100% agree, But I am disappointed that there is not an indicator to what the level of danger is that I am supposed to be facing. Previously you drove past a CFA station and you were immediately alerted to the fact it was a Total Fire Ban. You were also immediately aware of the danger by the arrow that was moved when deemed necessary. Now all you have is a little chart (hard to read at 100kph) with no indicator as to WHAT the danger is that I’m facing in that area I am driving through. It needs to be fixed and fixed now. An area less than 10km from me, borders 2 areas, one today was on Total Fire Ban, the other was not. All the signs are now totally covered up – so I have no idea. Bring back the old arrow and DANGER or bring back MODIFIED signs with the arrow. Not the non-indicative garbage we now have. The boys and girls of the CFA in my eyes do a job that many would be afraid to do – I admire their strength, courage and determination. I’m sorry that your leaders don’t behave in the same manner with pride and courage.